When the Insignia was first launched, it took everybody by surprise. It was literally a top contender in the big sedan segment, and that was right out of the box on the first try. Opel designed a brilliant car, larger than the 3-series or C-class but smaller than the 5-series and E-class, and less expensive than any of those, making a great proposition to anyone in the segment looking for a big sedan. The success of the Insignia on the European market spawned the same car in the U.K. under the Vauxhall badge, in Australian under Holden and for the U.S., it was sold by Buick and named the Regal. The car was such a hit that it captured all markets with a storm, bringing one of the biggest profits to the brand single-handedly in the first years. For 2017 it looks like the guys over at had a re-think and are starting nearly from scratch, because the exterior looks heavily modified. 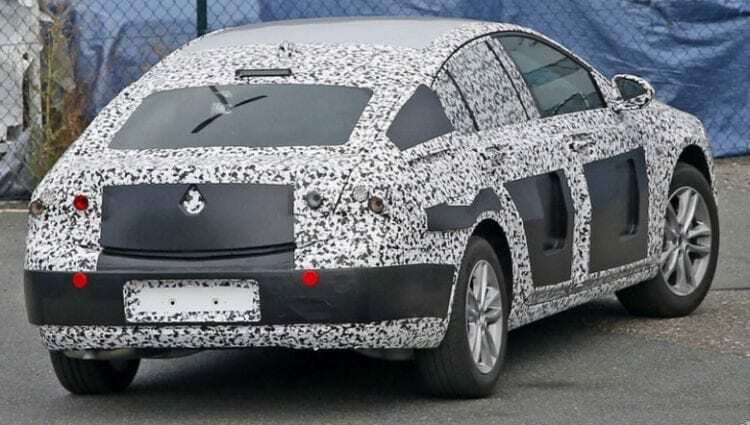 It’s still unclear what will be the final design, but from the very little we can tell from the camouflaged exterior it’s certain that it will be much closer to the 2013 Opel Monza concept car previewed at Frankfurt Auto Show in 2013. The Monza was a design study more than anything, indicating where the brand’s styling department was planning on going next. For the most part, they’ve managed to implement some of those features successfully in other vehicles, but the new 2017 Opel Insignia seems to be the closest to the concept. Now, of course, it won’t be anywhere nearly that aggressive or in your face, but the majority of the features seem to be there from what we can tell. The finished car won’t be debuted until the Frankfurt show in 2017, but we can speculate until then as to what it may be. For starters, some of the current Insignia models will disappear, leaving a smaller offering of body styles. The first confirmed model is a hatchback style vehicle, similar to the Honda Accord Crosstour or the Audi A7. The rear of it has the classic shooting-brake style and the hatchback cut-off section, but we can’t tell too much because of the camo paint. Expect a wagon (caravan) version for the European market only. The current Insignia is sold as a wagon just in Europe since the U.S. buyers don’t really seem to take that much interest in wagons, but there will be a normal sedan-style body just like the current Regal GS. Not bad news, but a shame if you were expecting a wagon for the U.S. market. The wheelbase of the new Insignia will be almost 4 inches longer, giving more cabin as well as cargo space. We know new cars tend to be lighter than their predecessor, and this one is no different, expected weight savings are somewhere in the 400 pounds (200kg) area in some extreme cases but in most cases it will manage to shed about 100 pounds. It will look somewhat like the Monza concept but don’t get your hopes up about the big gullwing doors. Still, if you’re reading this Opel, maybe consider them? They would sure make for a unique sedan and we could see Tesla Model X attracting an insane amount of attention because similar feature. The increase of the wheelbase should yield in more cabin space inside, but not by a whole lot. The very few spy shots available from the interior show that it’s still largely recognizable Opel/Vauxhall, but even just by looking you can tell the interior materials have been improved even if it does still look dull and dark. It should come with an OnStar system, Wi-Fi hotspot, and smartphone integration. 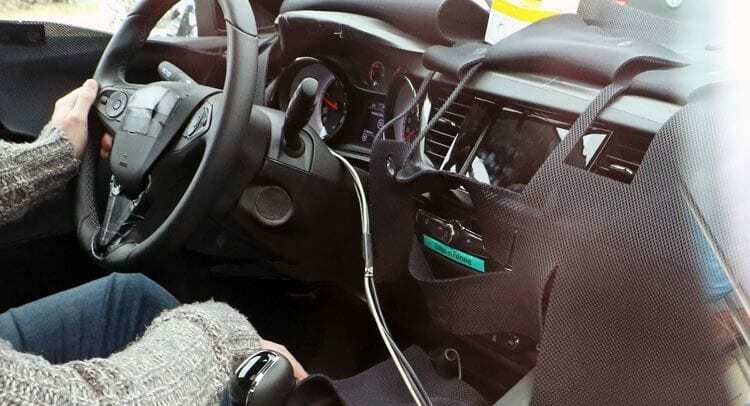 The dash has been covered so that sneaky photographers can’t leak any information, but rumors are that it might come with a large digital display in the dashboard rather than the analog dials. This won’t be such a surprise if implemented since we already saw it on the Monza concept. It surely won’t be the full-sized screen from the concept with 18 LEDs but will most likely be a welcomed addition, especially if it offers some customizability to the users. The interior of the current Insignia is the most we can judge the new one by, but taking into account the slight improvement new models usually bring to the table we expect the 2017 Opel Insignia to feature even more high-quality materials and even better fit and finish. The previous one isn’t exactly bad. It is, in fact, one of the best in class when it comes to interiors. Once we get a drive in one, we’ll be able to report further. Now, just to be clear, no drivetrain information has been confirmed yet, but we have a pretty good guess at what it will have. The current car has a 2.4-liter four-cylinder in a hybrid system and can deliver up to 182 hp. As a second option, we could see the turbocharged 2.0-liter four cylinder developing 259 hp in the potent guise. It comes with front-wheel drive setup as standard but has the choice of a four-wheel drive system at extra cost. Most buyers in the U.S. opt for an all-wheel drive version so it’s safe to assume the new one will offer it too. Expect similar engine choices on the new one, maybe with slightly more power and bumped fuel efficient, but we’ll be really surprised if we see a new engine with different displacement. Seeing as how most of the competitors like the Accord or the Fusion have a hybrid in the range, we expect the new Insignia to come with a hybrid in the range too. The biggest updates for the Insignia are expected in the safety department. Currently, a lot of attention has been devoted to this segment from all brands, so each year we see safer and safer cars. We suspect most of the stuff like lane-assist and blind-spot monitoring will be present in the Insignia, but we could be surprised with some new stuff we haven’t seen in the previous version. The current Opel Insignia sells for $27,000 and judging by previous Opel and Buick models that price should remain nearly the same for the new one. Now that’s, of course, a base model. Should you want, all of the gadgets expect a price closer to $45,000. I’m not considering buying one but still it’s nice to see it comes with a hybrid engine. I was just hoping it would generate more power but don’t doubt it’ll deliver the goods.